Rates per person, per night. The prices expressed do not include Taxes. According to current legislation, these rates will be exempt from 10% VAT when the guest staying abroad. For this exemption to be effective, the presentation for a photocopy, at the time of the Check-in, of the document (passport, DNI or cedula) certifying the residence of the guest abroad is mandatory. Uruguayan passengers will not pay this tax in the period between the first Monday after Tourism Week and November 15. This benefit will not be applicable when the invoice is issued in favor of a Uruguayan taxpayer company, with RUT. First two occupants of a room applies higher rate. Children under 3 to 12 years old, even sharing a room with their elders, pay a lower rate. Children under 0 to 2 years inclusive are our guests. 13 years (fulfilled) and onwards pay as a major. Offer valid at Arapey Thermal Resort & Spa. Offer valid between January 02, 2015 and March 31, 2015. With the purchase of 3 nights, 1 night of gift. With the purchase of 4 nights, 1 night of gift. With the purchase of 7 nights, 2 nights of gift. - Not combinable with other promotions and / or benefits. - Valid only for new reservations. - Number of rooms limited. 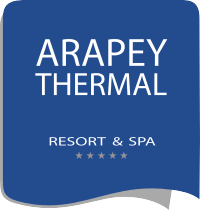 - Arapey Thermal Resort & Spa reserves the right to modify its rates and cancel this promotion without prior notice at any time. - If the VAT is increased or reduced and new taxes are created, the prices will be adjusted accordingly. - In case of opting for a late check-out, the same must be paid at the hotel in accordance with current rates policies. - Promotion applicable outside of Uruguayan and / or Argentine holidays and Carnival. - Reservations DO NOT admit cancellations.